Defending champions Ivory Coast begin the defence of their Afcon title with a game against West African rivals Togo on Monday. The Ivorians defeated Ghana on penalties in the last edition to nick their second ever title and put to rest the perception that the ‘golden generation’ would never lift a trophy. One of the continent’s in-form sides, Ivory Coast will look to start on a bright note by defeating Togo, who is led by Claude Leroy, a veteran of the Africa Cup of Nations. There is no Yaya Toure or Gervinho this time out but the Elephants, with Michel Dussuyer at the helm, have a new crop of youngsters who want to make a name for themselves. Franck Kessie is one of the new players who Ivorians hope can help defend the title. The youngster is an exciting central midfielder who has made a big impression in the Italian Serie A with Atalanta. Wilfred Zaha is also part of the squad after switching allegiance from England, as is Eric Bailly of Manchester United and the long-serving Serey Die, who will provide experience for the Elephants. 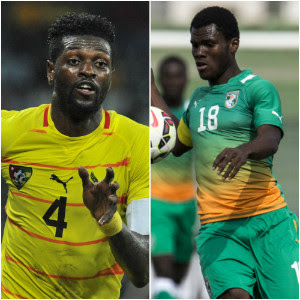 Togo have the talismanic Emmanuel Adebayor in their squad, even though there will be concerns as regards his fitness as he hasn’t played any competitive football in nine months. Leroy, [above] making his ninth Africa Cup of Nations appearance, will hope the team can surprise many people in Gabon and do the impossible by upsetting the defending champions. Olympiacos of Greece’s Alaixys Romao is one to look out for in the Togolese side that includes veteran goalkeeper Koffi Agassa, who is club-less at the moment. The experienced Serge Akakpo and Sadate Ouro-Akoriko will be relied upon in defence to ward offIvorian attacks that will definitely come in torrents. The second game in group C will be between two teams who haven't won the title in years but are looking for glory in 2017. Morocco will be in Gabon with Herve Renard, [below] who has won two of the last three Nations Cup titles. He has likely packed his lucky white shirt. The Frenchman took Zambia to the title in 2012 and repeated the feat with the Ivory Coast in 2015, so the possibility of a hat-trick of titles is imminent with the Atlas Lions. It's been 41 years since Morocco won the title and Renard will look upon skipper Mehdi Benatia of Juventus to lead them to victory against a strong DR Congo side. The Moroccan team possess numerous technically gifted players such as Karim El Ahmadi, Youssef El-Arabi and Mbark Boussoufa, but will have to do without Younès Belhanda and Oussama Tannane, who have been ruled out of the tournament through injury. Winners in 1968 and 1974, Congo DR will launch another assault at the African title, with the first group game against Morocco a litmus test of their ambitions. Florent Ibenge’s side won five of their six matches in qualifying for the tournament and will hope that form can propel them to a win against Morocco. In Chancel Mbemba, they have a reliable centre-back who will be complemented by Gabriel Zakauni, Ikoko Jordan and Bope Bokadi Merveille. In attack, they have the giant of Hull City, Neeskens Kebano [below] and Cedric Bukambu of Villareal. Captain Youssouf Mulumbu holds the midfield for Ibenge’s side, who will be missing colourful goalkeeper Robert Kidiaba, as the shot-stopper didn’t make the cut. Both games will be live on SuperSport. Game one will be at 16:00 CAT and game two at 19:00 CAT. For weather conditions at the Stade d'Oyem.